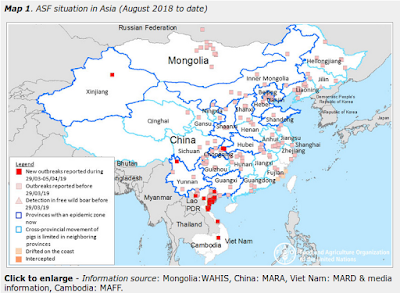 After going a month (Jan 21-Feb 19th) where they reported only 1 outbreak of African Swine Fever, today the China's MOA has reported their 7th outbreak (across 6 Provinces) in the past 9 days. The Information Office of the Ministry of Agriculture and Rural Affairs was released on February 27, and an African swine fever epidemic occurred in Jingbian County, Yulin City, Shaanxi Province. On February 27, the Ministry of Agriculture and Rural Affairs received a report from the China Animal Disease Prevention and Control Center, which was diagnosed by the Shaanxi Provincial Animal Disease Prevention and Control Center and an African swine fever epidemic occurred in a farm in Jingbian County. Up to now, the farm has 11,334 live pigs, with 150 heads and 62 deaths. Immediately after the outbreak, the Ministry of Agriculture and Rural Affairs sent a steering group to the local area. The local government has started the emergency response mechanism according to the requirements, and adopted measures such as blockade, culling, harmless treatment, disinfection, etc., to treat all the sick and culled pigs harmlessly. At the same time, all pigs and their products are prohibited from being transferred out of the blockade, and pigs are prohibited from being transported into the blockade. At present, the above measures have been implemented. Along with this recent surge in reporting, a Google search for the term `死猪'' (`Dead Pigs') returns a daily barrage of Chinese media reports of suspicious die offs of pigs around the nation, along with the illegal dumping of pig carcasses. While African Swine Fever is often explicitly denied by local officials, explanations are rarely provided. There are, admittedly, a number of other serious pig diseases common in China - including FMD, PED & PRRS - that could produce significant pig mortality. 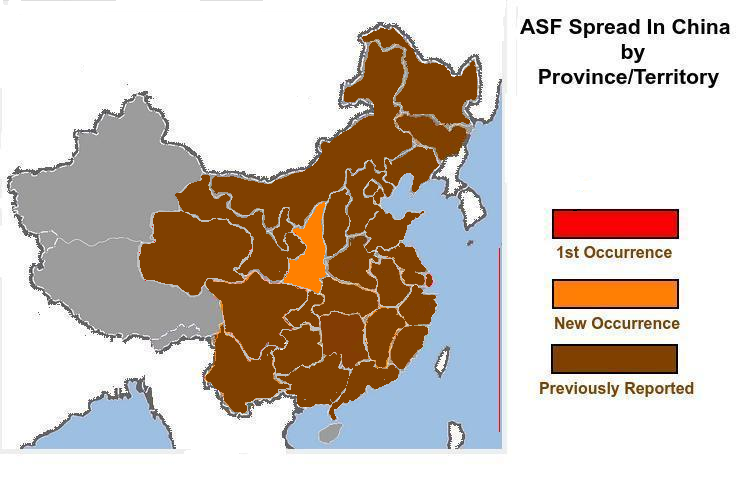 But increasing detection of ASF contaminated food products by customs officials in Taiwan, Japan, South Korea, and Australia suggest significant quantities of ASF contaminated pork are making it into China's food chain. While ASF poses no health risk to humans - it does speak to the amount of undetected infected livestock being processed - and their export greatly increases the chances that the virus will be spread to other regions of the globe.